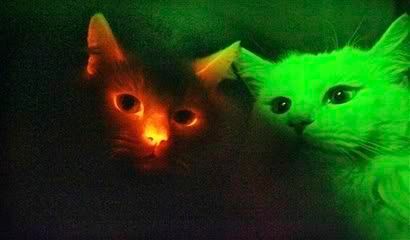 This picture taken through a special filter in a dark room shows, a cat, left, possessing a red fluorescent protein that makes the animal glow in the dark when exposed to ultraviolet rays, appearing next to a normal cloned cat, right, at Gyeongsang National University in Jinju, south of Seoul, South Korea, Wednesday, Dec. 12, 2007. South Korean scientists have cloned cats that glow red when exposed to ultraviolet rays, an achievement that could help develop cures for human genetic diseases, the Science and Technology Ministry said. Anyone have any thoughts on this? At first glance, the picture looks cool, but I just assumed it was some fancy lighting or creative photoshop. I had no idea that the cat was actually glowing because a fluorescent protein it was exposed to.....nor did I have any idea that the cats were cloned. They are Christmas cats. Yes, they do look pretty cool, but I'm not sure how I feel about all the sciencey stuff involved.